On Monday 8 May we’ll be unveiling new spaces at Swanston Library including a brand new Library entrance! You’ll enter the Library in Building 10, Level 5 above RMIT Connect. The new spaces will include some amazing, light and bright study spaces on Level 5 and Level 6 in Building 10 and 12. Here's just some of what we have in store for you! 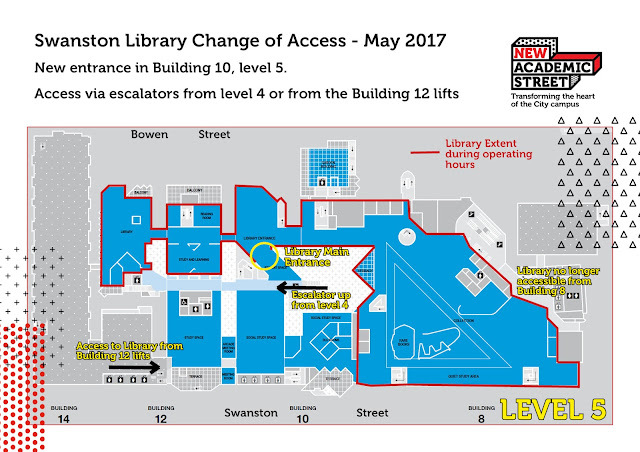 The Library service desk will move to a new location at the top of the escalators in Building 10. There'll be cupcakes on Monday to celebrate so please come and say "Hi". We are very excited to be integrating the Study and Learning Centre drop-in space into Swanston Library (except for statistics and chemistry which will stay in Building 80). Students will be able to build their academic skills with the help of the SLC Learning Advisors or Student Learning Assistants plus our Librarians. Swanston Library opening hours are weekdays 8am-midnight, weekends 10am-5pm. However, our transformation is not yet complete. Building 8, Level 6 of the Library will close for refurbishment soon, reopening at the end of July and at the same time we unveil yet more new study spaces. We thank each and every one of you for being so patient as we’ve been renovating. We’re so pleased and excited to be opening and sharing the next phase of the new Library with you!